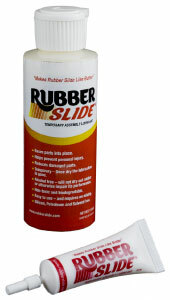 Rubber Slide® was specifically designed for the aftermarket and is conveniently packaged in tubes and bottles for repair shops, dealerships, fleet usage, kitting and resale. TWO NEW SMALL SIZES AVAILABLE FOR PURCHASE! 4 Tubes for $9.50 or 1 Bottle for $6.00! The best new tool for your tool box! Rubber Slide® significantly reduces friction thereby reducing the installation force required to assemble parts and fittings. It helps avoid slippage related and repetitive stress injuries; reduces rejects; and improves product performance. Use it to install grommets, O-rings, hoses, tires, seals, plugs – any rubber or soft plastic parts. Compatible with rubber, metal and most plastics. • Eases parts into place. • Helps prevent personal injury. • Temporary – Once dry the lubrication is gone. • Alcohol free – will not dry out rubber or otherwise impair its performance. • Easy to use – and requires no mixing. • Silicon, Petroleum and Solvent Free.